There are those who say advertising on Facebook doesn’t work however that is indeed how news about this musical arrived at the Jowheretogo Studio. The writer of the book, Greg Kotis, found himself in Europe with limited funds and having to time food and visits to the loo so that they coincided and hence reduced his expenditure. From that this clever and politically savvy production was created. It picked up Tony Awards for its Broadway run in 2001 and it seems to have taken a very long time to get its much deserved UK premiere. The location for scene one begins at the Public Amenity number 9, a urinal for the poorest people. It is managed by Penelope Pennywise, performed by the accomplished Jenna Russell. She has assistance from Bobby Strong, a role which has Richard Fleeshman exhibiting his star quality. A problem with some recent shows is that the audience cannot always identify with the characters but that is not an issue here. Fleeshman and Russell convey their roles in a way that immediately wins the audience over without getting two preachy. 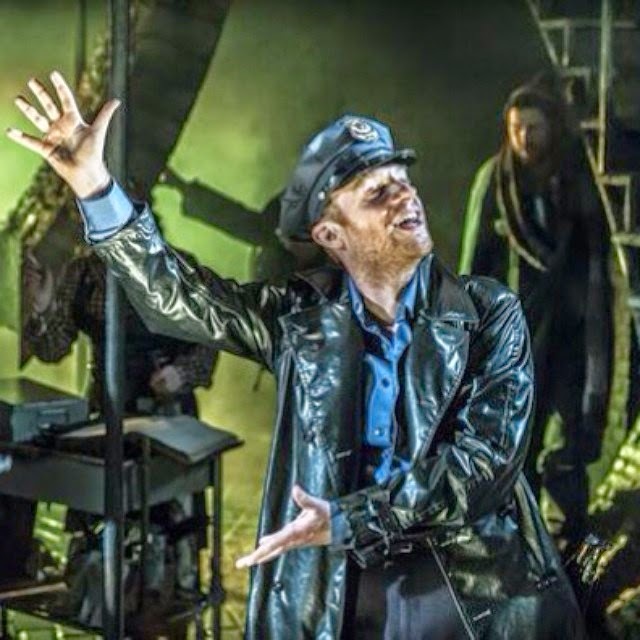 Urinetown is also a comedy and that tongue in cheek element is carefully orchestrated through a narrating Officer Lockstock (Jonathan Slinger) and Little Sally (Karis Jack) who between them discuss the dynamics of musicals with a degree of clever metacognition. No, it is not always a happy musical and the title is awful, but don’t let that put you off as the music is happy and memorable and it is a highly entertaining show. Production design by Soultra Gilmour is impressive. In the small space offered at the St James Theatre we have a 2-tier set based upon a sewer pipe with rotating sets and a innovative moving track. The set looks fabulous but be warned that a front row seat might make a struggle to see what’s happening upstairs. Sustainability and corporate greed may not be an obvious combination for a great evenings entertainment but the bad guy Caldwell B Cladwell was delightfully portrayed by the understudy Adam Pearce, and his daughter Hope (Roseanna Hyland) had a powerfully moderating influence. A problem with recent new musicals that the Jowheretogo gang have seen has been the quality of the songs themselves. Totally forgettable tunes that leave no lasting impression seem to be an inherent problem in many shows. 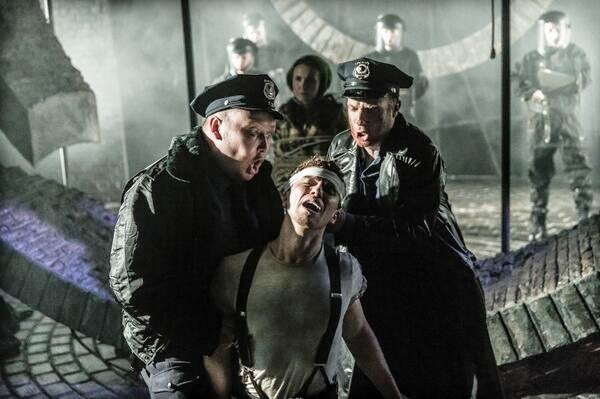 This is not a problem with Urinetown, and a cast recording, for once, is worth buying. The Cop Song, Don’t be the Bunny and Run Freedom Run are all earworms that compete with the title song for merit. The strong cast delivers each one impeccably backed by a strong orchestra under the musical direction of Alan Williams. The harmonies are a delight and the knowledgeable audience applauded each one with gusto rather than out of duty or etiquette. 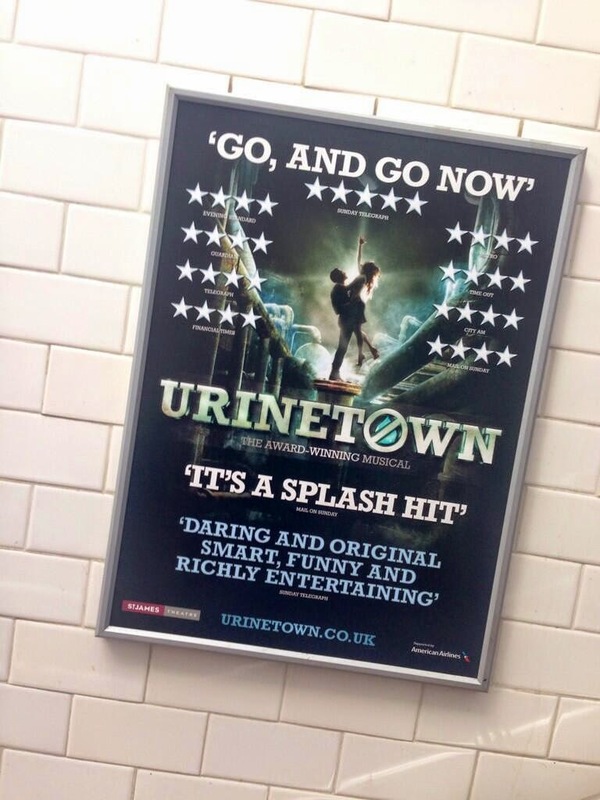 The rest of the creative team should be mentioned for the spectacle that is Urinetown. Enticing choreography by Ann Yee, engaging lighting design by Adam Silverman, and highly effective sound design by Terry Jardine and Nick Lidster. It is a real shame that it is on a limited run. 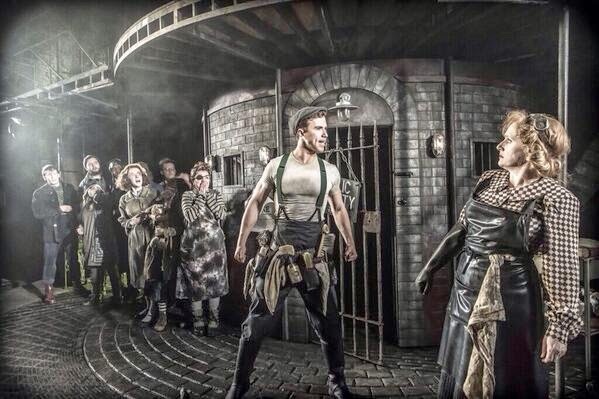 The show deserves a full west end run and a full UK tour. People are returning to see it again because, quite simply, it is one of the best shows to see. We don’t say that very often. Runs until 3rd May 2014.